On Sunday, December 11, 2011, at 10:14 P.M., inspired by a book I no longer remember, I created a note in on my phone in the Evernote app called 100 Things Before I Die. On Saturday, January 11, 2016, at 11:02 A.M., I completed Entry #100. I don’t remember the name of the book but I vaguely remember the anecdote in the book that inspired me to start the list. The author (a motivational speaker of some sort) talked of conducting a multi-day seminar where he gave his students the assignment to return on the second day with a list of 100 things they wanted to have done before they died without worrying about how they might accomplish any of these goals or whether the goals were even possible. Just let your mind go free. The next day, the author said, very few people had completed the list which he knew would happen. Only the true go-getters, the author explained, can open their mind enough to even see what is possible in life. I am not, it would appear, a true go-getter. If I had started my list on a notepad or in my journal that would be the end of this story. 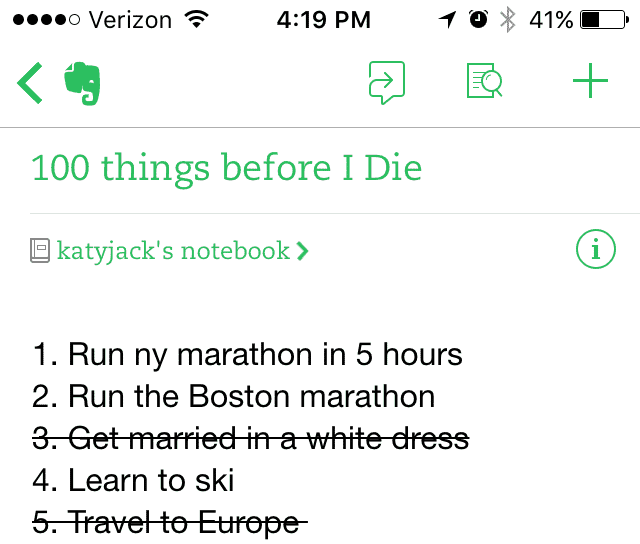 But I started the list on a note-taking app because I had the idea that I would check off any of the goals that I met. I actually use Evernote to keep track of a lot of different information so I would run across the list fairly frequently. And every now and then, I would catch myself having the thought. You know the one. “Someday, I would like to…” And when I did, I’d put it on my list. I’m sure there were months when I didn’t touch the list. But I updated it more consistently than you would think considering it took me five full years to finish it. And now that I’m finally done, I’ve discovered that the complete list of goals paints an interesting self-portrait that is uniquely my own. I’ve learned several things about myself that I wouldn’t have known if I hadn’t taken the time (all that time!) to make a list of wild goals. I’ve actually accomplished some improbable things in the past five years. Of my 100 items, I have accomplished and crossed off 12 of them. That’s actually pretty good considering most of the items I put on the list are very long-term and extremely improbable. Obviously any list of personal goals is, well, really personal so I’m not going to share all 100 with you (and do you really want to read all 100 of my goals? ), but I’ll share with you the first five that I wrote on that night in 2011 when I was a single mom struggling to make ends meet. I would have told you Goal #3 was the most improbable of all. So hey, maybe I will get to see the Northern Lights someday. I haven’t changed very much in the last five years. My life has changed so much in the last five years! But what I want from life has pretty much remained the same. Looking back at the list, I only see one item that I actually have no interest in accomplishing now. I don’t think I really wanted it when I put it down the first time. But my rule is, if it goes on the list, it stays on the list, so it stays in its spot. My list of goals ended up being a map of my ideal life. I expected that my goals wouldn’t necessarily have much in common. Instead, when you read the list as a whole my list presents a fairly detailed picture of the type of career I’d like to have, how I’d like to spend my time, who I want to spend my time with, what kind of mark I’d like to leave on the world, and yes, the amount of money I’d like to have. Once I finished my list, I knew what to do next. I don’t remember my book saying what the go-getters my author described did with their list of 100 goals in life, but once I finally completed my list I immediately saw what I should be doing next. I’ve got a great picture of the life I could be working to achieve now, so it’s time to start working for it. I noticed that I’ve been using the word intentional a good bit on the blog and it fits here too. It’s time to start being more intentional about how I spend my time and focusing on whether my actions are taking me toward the life I described in my goals list or away for it. I can only imagine how many items can be struck though on my list five years from today if I start working towards my goals with intention. 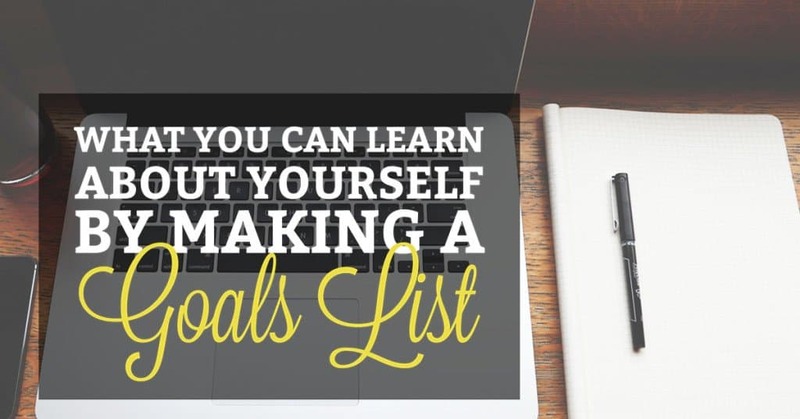 Have you ever undertaken any kind of life list or list of goals? I’d love to know what some of them were and if you ever reached them. Love what you said about looking at where you want to be & being very intentional on how you spend your time. Good thoughts to ponder today. I’m a total list maker and planner addict. I have made some life lists, I will have to dust it off and see what was on it! I started taking Elite Blog Academy and one of the exercises was to make such a list of our huge goals, not 100 per se, but our ideal life in various aspects. It’s a great exercise to go through. I hope you’ll stop by and linkup with our Small Victories Sunday Linkup, goals, blogging tips, food and book talk are great topics to share with us! I love looking at old lists – it’s so revealing to see what’s changed in priority and what hasn’t ! I will definitely drop by your linkup on Sunday. Thanks for stopping by! I use Evernote too but find that I do better just using the notes on my iphone. My list isn’t at 100 but I need to add more. I also looked back at old lists and a lot has changed. You are right that these lists are a guide to what kind of life you want! I love this idea. I had a bucket list that I kept for a while but I need to whip it out and update it to 100! Total goal to get a list of 100! It took me years to do it and now I’m actually thinking about starting over. It really helps you focus on what’s important. My girlfriend and I made bucket lists while on a car trip over 20 years ago. I wish I had kept that list! I completed all the ones that I remember! I need to make a new list! I will call Danielle tomorrow! That’s so awesome. I just started a new one for myself. I’ve accomplished a few things on the last one and my priorities have shifted regarding some other items.